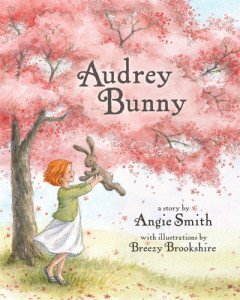 Audrey Bunny is a beautiful story about a bunny who had an imperfection which made her feel like she could never be loved.Â This story is a very good reminder of how we are so very loved! Included in the book is a Parent Connection in the back so that you can interact with your child a little more about the story. Â It shares some wonderful talking points and I think that any little girl would love to have this book read to them for years to come! It will keep you all grounded in knowing that you are special, no matter what flaw you think makes you Â you are not! Â I think that this story is a great confidence builder and is especially great to help with insecurities! From best-selling womenâs author Angie Smith (I Will Carry You, Mended) comes this sweet childrenâs book about a stuffed animal named Audrey Bunny who fears her imperfections make her unworthy of a little girlâs love. She’ll learn the truth soon enough, and young readers will learn that everyone is special and wonderfully made by God. Angie SmithÂ is the wife of Todd Smith (lead singer of Dove Award winning group Selah), best-selling author ofÂ Mended,Â I Will Carry You, andÂ What Women Fear, and one of the most popular speakers and blog writers in the country. She holds a Masterâs degree in Developmental Psychology from Vanderbilt University and lives with her husband and daughters in Nashville, TN. ← Power Outage: 10+ Tips to Be Prepared Next Time!